Native American jewelry is art and as such, it is often signed by the artist. This signature is called a hallmark. A hallmark can be a stamp, that is, an impression made into the sterling silver (or other material) by holding a die on the silver and striking the die with a hammer. Depending on the temperature of the silver, the integrity of the die, the force of the blow, the steadiness of the hands, and other factors, the resulting stamped hallmark will range from faint to deep, from fuzzy to clear. Stamped hallmarks can be all types of letters in various fonts as well as pictures and symbols. Another way Native American artists sign pieces is by using an engraver, also called and “electric pencil”. Zuni artists use this method to write out an entire name, or at least the last name, and often Zuni, NM too. Fetish carvers use an engraver to sign their mini sculptures and depending on the size of the base, they might be initials or a full name. In addition to individual symbol hallmarks, Shop and Guild marks are used. Shop and Guild marks (and there are many) are usually an image such as a bell (Bell Trading for example) or a sunface (a Hopi mark). When a piece has a shop mark it is hard to identify which specific artist did the work, and in many cases, it is a collaborative effort – one person does the silversmithing, one does stone setting, another inlays etc. With shop hallmarks, it is impossible to guarantee that the work has been done by a Native American artist as shops can employ anyone. With Guilds, however, it is almost certain that the work is Native American because membership in the guild is usually based on tribal affiliation. 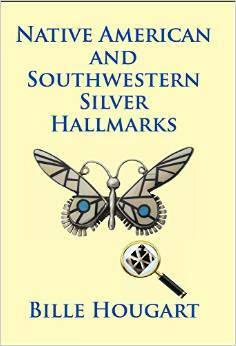 Why are Native American hallmarks important? In many cases, the hallmark on a piece of Native American jewelry is the only definitive proof that a particular item was made by a particular person. But even this is not foolproof because counterfeiters copy hallmarks onto their foreign-made, faux Native American items. The very best way to use hallmarks is in conjunction with paperwork, provenance, point of purchase, quality of workmanship and materials, the artist’s style and other factors that an experienced eye will see. Why is it Difficult to Identify Native American Hallmarks? 1. Several artists might use the same hallmark. For example, over 20 Native American artists have used S for their hallmark. 3. Family members might use a (famous) father’s, mother’s, brother’s, uncle’s or cousin’s hallmark. As an example, you will see this in the Iule family (known for their crosses) and the Effie Calavaza family (known for Zuni Snake bracelets and other snake items). This contemporary ring also has the EFFIE C. hallmark but is likely made, at least in part, by the family of Effie Calavaza. 4. Native Americans that sell jewelry at trade shows and fairs but do not make the jewelry themselves have told us that the associations hosting the event require that all items must be authentic Native American made and hallmarked. So when we asked about some of the hallmarks on the pieces we saw, we were told “Joe XXXX doesn’t used a hallmark on his jewelry. We just put something on his pieces because we were told we had to in order to sell it at the powwow so we used this hallmark “xyz”.” True story. Names changed. 5. Depending how well the hallmark is placed onto the silver, it may or may not be readable and could be confused with another hallmark. 6. Sometimes a piece will inadvertently not get marked. We’ve often purchased 6 similar pendants directly from an artist only to get home to see that 5 have hallmarks and one does not. When did hallmarks first appear? Native American artists haven’t always used hallmarks. Early items in the First Phase period usually had no hallmarks because the items were made for personal or family use, not for sale. 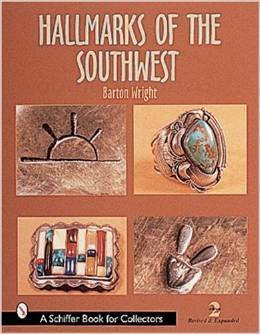 In the 1950s, the Navajo Guild, among others, encouraged hallmark use by its members. During the Native American jewelry boom of the 1970s, hallmarks kicked into full swing and their use continues to this day on the majority of jewelry items. Many authentic Native American made pieces have no hallmarks. The majority of stone necklaces (heishi, nugget etc) do not have hallmarks. The same goes for many silver bead necklaces. However, If silver beads are large enough, sometimes the artist will stamp the last bead up by the clasp with a hallmark. Alternatively, silver and stone necklaces might have a signature plate. Signature plate on a stone necklace. Items like twist bracelets, for example, just do not have a flat place to add a hallmark. But what’s particularly bad is that some pieces with seemingly authentic hallmarks are on pieces that are not NA made. How can you learn about the hallmark on your piece? WEBSITES – There are also some websites that list hallmarks. Here is one to get you started, but you can search on the internet to find more. You can browse our website and use the search link at the top of most pages to search for your hallmark. If we have or have had an item with that hallmark you will be able to find it on our site. Once you have exhausted all sources and still can not find the hallmark on your piece, you could submit it as a question through our website. In addition to the resources above, we can sift through our memories and look through our hand compiled lists to see if we can help. But, we receive quite a few questions every week so it will likely be 30-60 days before your question is answered. More Hallmark References for Native American Jewelry Aficianados ! You can purchase them in our store. Click any photo. This volume profiles over 1,200 Indian jewelers from all tribes over the past two centuries. The text is illustrated with over 2,000 photographs. This book was created with the cooperation of Indian artists. Through artist surveys, archival research and personal interviews, information was collected in 25 categories: including the artist’s tribe, clan, active years, type of jewelry, lifespan, family relationships, education, teachers, students, awards, exhibitions, collections, forms, techniques, materials, favorite designs, and publications. Websites and email addresses were listed when possible. Many completed a personal statement, “I enjoy creating artwork, because…” Some wrote or narrated autobiographical statements. This is a standard reference for American Indian jewelry, a source for factual information, neatly organized and lavishly illustrated in full color. This is not a revision of our bestseller, American Indian Jewelry I, but a completely new manuscript, organized in two volumes, A-L and M-Z. Look up any one of over 5,000 American Indian Jewelers in seconds. Each profile identifies the artist by tribe, clan, active years, styles, lifespan, residences, education, teachers, students, awards, exhibitions, demonstrations, collections, photographs, and publications. Many profiles feature original quotations from the artists, as well as comments from scholars, collectors and veterans in the field. Personal portrait pictures and close-ups of their jewelry help to bring their biographies to life. The Hallmark Directory offers high resolution, digital close-ups. 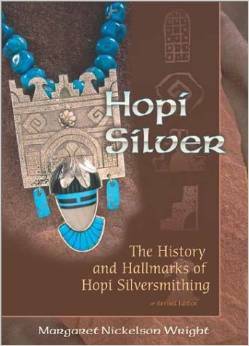 Many Native American jewelers stamp their work with personal, pictographic symbols or initials. This feature helps identify jewelers. 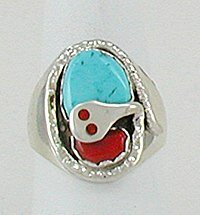 The Natural Turquoise Directory helps one identify turquoise in Native American jewelry. This is important because the best – Gem-Quality, High-Grade – natural turquoise is valuable. Keys to identification help identify over 25 by specific mines, chosen in a worldwide vote by veteran turquoise collectors. 3. and new categories for social networks and email addresses. Furthermore, extensive genealogical research was conducted. The National Archives released the 1940 U.S. Census and the 1930s Indian Census records. Each artist’s family also was more thoroughly researched with the aid of computerized genealogical services.